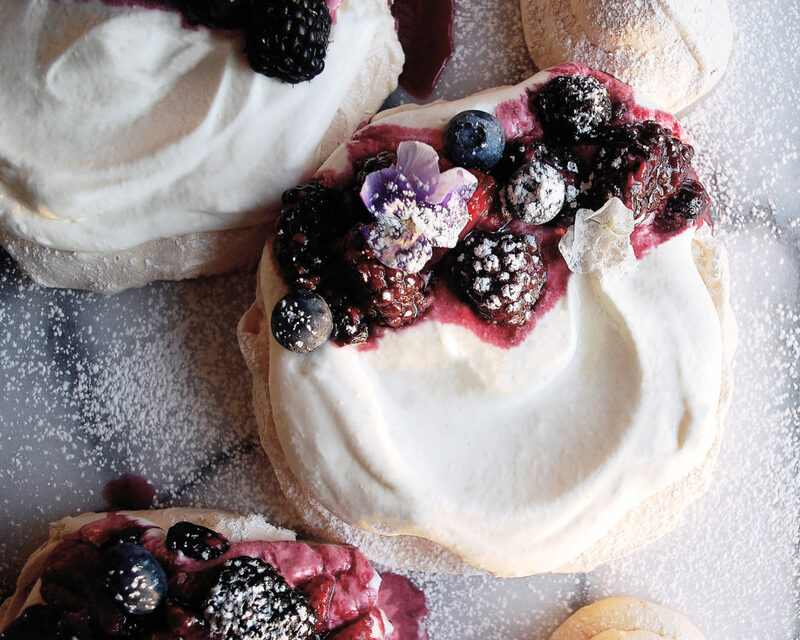 Crisp and airy meringue, freshly whipped cream, and sparkling wine roasted berries…these pavlovas are the dreamiest, most enchanting summertime dessert. 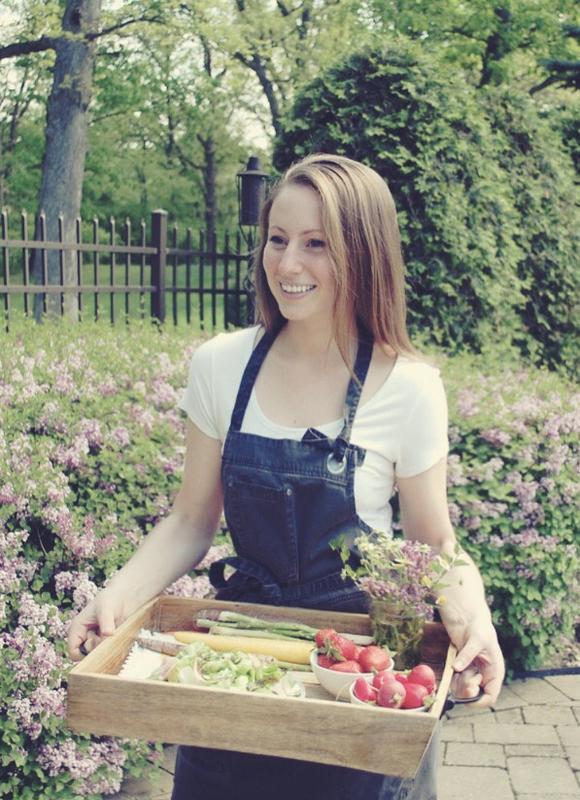 A “pavlova” is typically one large mound of meringue baked until crisp, usually topped with whipped cream and berries. It’s meant to be messy and to be shared. I decided to make smaller, individual pavlovas, so everyone can have their own little personal dessert. They’re still kind of messy…but that’s just sort of the fun of it. If you’re not familiar with meringue, it’s basically whipped egg whites with the addition of sugar and an acid (typically vinegar or cream of tartar). Meringue is served all sorts of ways and is seen in many different desserts. My favorite version being a “Husk Meringue with Corn Mousse” served by chef Enrique Olvera at his famed restaurant, Cosme. I was lucky to have been at a conference last year in Napa where he made samples of the dessert. It was honestly to this day one of the best desserts that I have tasted. I’ve kept this pavlova more on the traditional side, with a basic meringue recipe and fresh whipped cream that has just a touch of vanilla. The real magic of the dish lies in the texture. 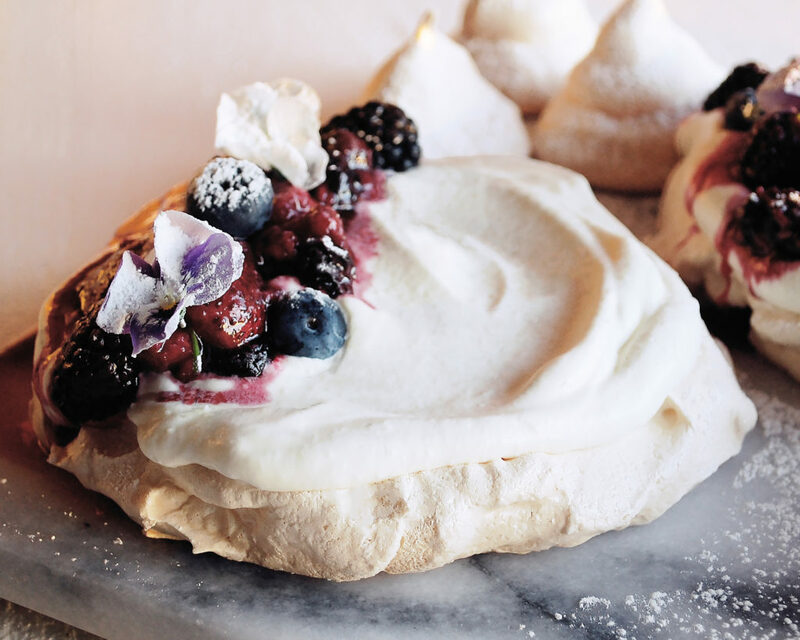 The meringue bakes low and slow to develop an unbelievably crisp texture. You can think of it as basically “drying out” in the oven. So you’ve got a hard exterior shell, but then when you break into it, the inside is airy and marshmallow-like. It is unbelievable. Add some whipped cream that is whipped just long enough so that it holds its shape, but still has a smooth, soft ripple to it and you’ve got some serious indulgent bites. Instead of fresh berries, I roast mine with a dash of sugar and sparkling wine. Just long enough so the berries soften, deepen in flavor, and create a beautiful drizzling syrup for the meringues. You’ll want to make sure to allow enough time for the berries to cool down before adding them on top of the whipped cream. 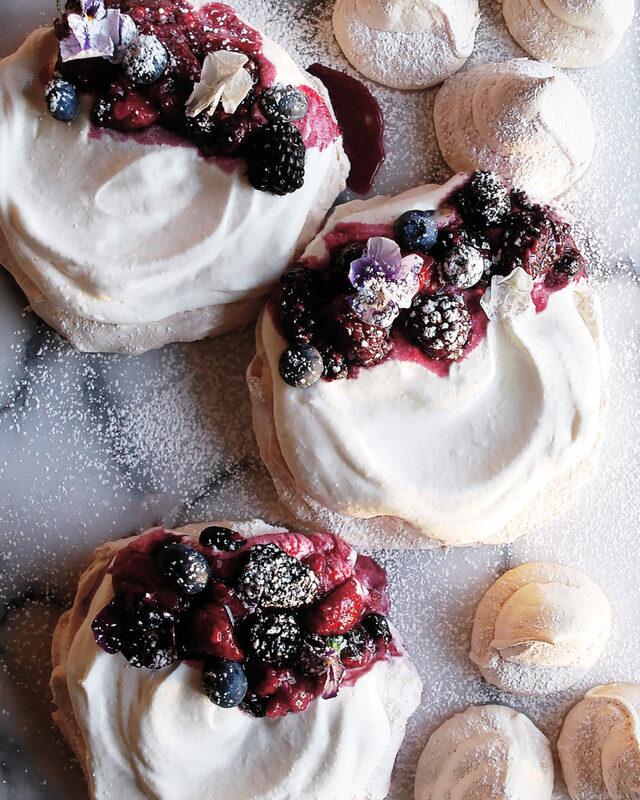 I will absolutely be making these pavlovas all summer long, especially alongside this Ultimate Summer Cookout spread. I might even get a little more creative with the next one, adding flavor to both the meringue and the cream…we will see. Enjoy! Preheat the oven to 300F. Prepare a sheet pan with a piece of parchment paper. Use a pencil to trace 4 (4 ½-inch diameter) circles onto the paper. Flip the paper over, pencil markings side down. Combine the egg whites and salt in a stand mixer bowl. Begin to whisk on medium speed until frothy. Increase the speed and whip the egg whites until they form soft peaks. With the mixer still running, gradually add in the sugar in slow increments (this process should take about 5 minutes). Once all of the sugar has been incorporated, continue to beat for another 2 minutes until the sugar is fully dissolved and the meringue is extremely glossy. Remove the bowl from the stand mixer and sift in the cornstarch. Add the vinegar, vanilla extract, and almond extract. Gently fold all the ingredients in until fully incorporated. Spread the meringue onto the prepared sheet pan in even circles, using the pencil outlines as a guide. The meringue in each circle should be flat, raising about 1 inch from the surface. Use a small, offset spatula to create small little peaks throughout the meringue. Transfer the sheet pan to the oven and immediately drop the heat to 250F. Bake for 1 ½ hours. 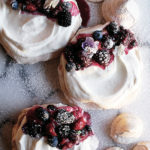 Turn off the heat, crack the oven door, and let the pavlovas cool completely in the oven as the oven cools down as well. After about an hour or so of cooling, the pavlovas should be cool. Serve immediately. Preheat the oven to 375F. Add the berries to a small baking dish. Pour in the wine, sprinkle the sugar evenly over top, and add a pinch of salt. Gently toss. Roast the berries in the oven for 20-22 minutes. Let the berries cool completely before serving. Add the cream to a stand mixing bowl and begin to whisk on medium speed. When the cream is frothy, add the sugar. Increase the speed to high and beat the cream just a little longer until it is soft and smooth. It should hold a very soft peak (you don’t want to create really stiff peaks for this recipe). Gently fold in the vanilla extract. Remove the pavlovas from the parchment paper by gently peeling them off. Transfer them to a plate and spread a large mound of whipped cream smoothly over each pavlova. Top each one with a spoonful of roasted berries, along with a drizzle of the sparkling wine liquid from the baking dish. Garnish with edible viola flowers and a light dusting of powdered sugar. The recipe says to preheat oven to 300 degrees, then put meringues in and immediately drop temp to 300 degrees. Is this a misprint? Should I heat the oven higher, then drop? Hi Genie! Thanks for catching that! It’s supposed to say drop the temp to 250 degrees.